JETHRO TULL-...LIVELY ARTS..."BBC Documentary - North American Tour 1979"
This documentary was filmed in the first half of 1979. 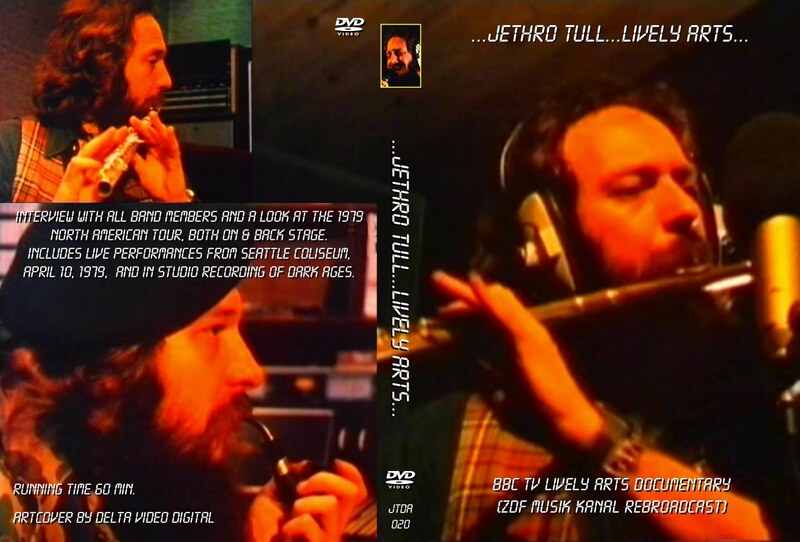 It includes interviews and statements of all band members, as well as some rare concert footage that was filmed at the North american tour in 1979, probably most of it at the Seattle Coliseum April 10, 1979. Also some rare footage from the "Waters Edge" ballet can be found, as well as the band rehearsing the unreleased track "Apocalypse". The documentary was broadcast in various countries. 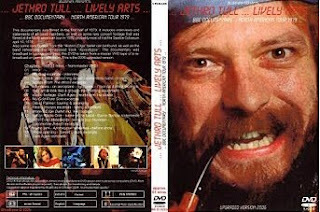 "...Lively Arts..." es un documental filmado por la BBC, en colaboración con la Televisión alemana, a principios de 1979. 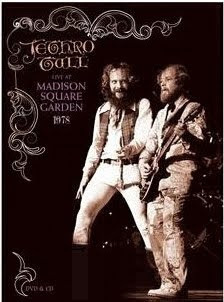 Incluye entrevistas con todos los miembros que entonces formaban la banda, así como raras imagenes del grupo en concierto grabadas en su gira por Norteamerica de 1979, la mayor parte extraidas problablemente de su show en el Coliseum de Detroit del 10 de abril de 1979. Tambien podreis ver imagenes del espectaculo "The Waters Edge" que el grupo hizo, con ballet, ese mismo año, asi como la banda ensayando un tema inédito, "Apocalypse". Éste documental fué retransmitido en su momento por numerosos países. 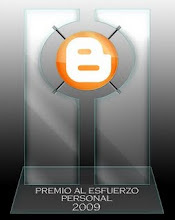 NOTA: ESTÁ EN VERSIÓN ORIGINAL, INGLES, SIN SUBTITULOS EN CASTELLANO. In Part One, he discusses his preference for playing acoustic over electric guitar, the upcoming non-Tull band tour, and reveals what was the worst song he ever wrote. 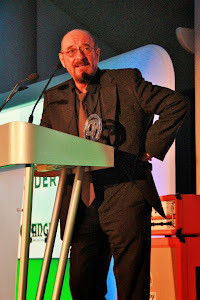 Ian Anderson: I do my bit within that context, but you have to understand that I don't play those instruments you're associating. I don't do the kind of big, electric guitar thing. While I've played some electric guitar, it's something you kinda do, and you make that noise and it's about turning this sound up to that and sorta putting in this effects unit or using these kind of strings or humbucking pickup or whatever. And you go, "cha chang" and it sounds like everyone else. And you think, "Well I've done that. I don't need to do that one again." [laughs] You get it out of your system pretty quickly and concentrate on things where you have something of your fingertips. Where it's a little more - to me - a little more responsive and organic. And that unfortunately isn't really the electric things. There's some people that do that for a living and it's a joy to do, but it's not my personal experience of music, you see. My guitar player Martin Barre, he's the guy who, when I wrote a riff on the acoustic guitar that went, "bum bum bum bum baaa dum" ("Aqualung") and I sat there in my hotel dressing room somewhere in the USA in about 1970, played that and said, "well this is how it goes [guitar noise], and then maybe we should turn it up a bit and see how it sounds." That's how you arrive at those things. "Locomotive Breath," which was probably around the same period of time, was in fact, funny enough, just before I came to the phone to call you, I was playing "Locomotive Breath" on my acoustic guitar, using a different time signature and key and fooling around with some other ideas for a different arrangement of the song. These things are part of my life and my music-writing, but I don't necessarily feel them perhaps in the context in which you might hear the record was recorded in '70, '71. Brett Milano: First let me ask about your upcoming tour, because you're touring with a band that isn't Tull, and I'm assuming that you're going to play stuff from a different side of the repertoire. I'm wondering what the plans are for that and where you plan to take things. 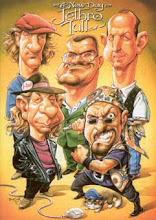 IA: Well the guys that I play with include some musicians that have on-and-off played with Jethro Tull, have very recently only a few days ago as Jethro Tull because our drummer Doane Perry is in Los Angeles and taking a break. And we had a couple of shows that really for him to fly all the way over to England just to do two concerts and fly all the way back again given that he's gotta come out in just a couple weeks' time to rejoin us for a month and a half of solid touring with the band, didn't make a lot of sense. So we used the other drummer guy. The other drummer used to be my son, but he's busy with his own band and doing other stuff, so the other drummer at the moment is a guy called Mark Mondesir who's essentially known as a jazz drummer. He's a regular guy that plays with John McLaughlin - now there's a guitar player - and he's doing solo stuff with me but has also filled in a couple of times when Doane is not around and it's just a single isolated concert. Who else we got? Florian Ophale, German guitar player who covered for Martin Barre last week because Martin was away in Germany doing a Celtic rock opera. Martin had a week he couldn't do, weekend in fact. The same weekend we had some festival dates, so Florian came and did what hadn't been contracted as a Jethro Tull gig anyway. 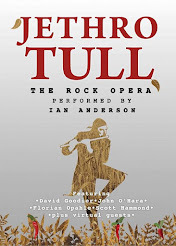 Although it's true to say that the "regular band" of Jethro Tull is me and Martin Barre and Doane Perry, plus these days David Goodier on bass and John O'Hara on keyboards, it's a very flexible, movable beast really. Other people come and go and guests come and go playing different instruments. So it's kind of a flexible arrangement. And when I do the solo tour it's obviously to get away from, I supposed, the obvious Jethro Tull context of loud electric guitar with Martin Barre or big thunderous drums with Doane Perry. We sort of move it a little bit more towards either an acoustic or an orchestral setting. I've done tours in the US in the past as more of an acoustic thing and these tours that I'm doing from September on are essentially, well in the UK and America they are acoustic shows and some of the other shows before in Iceland or afterwards in the Czech Republic and Germany, those will feature some electric instruments as well. That's with other musicians and other guests and things going on too. But for the most part the bulk of the dates are what I would describe as really acoustic. 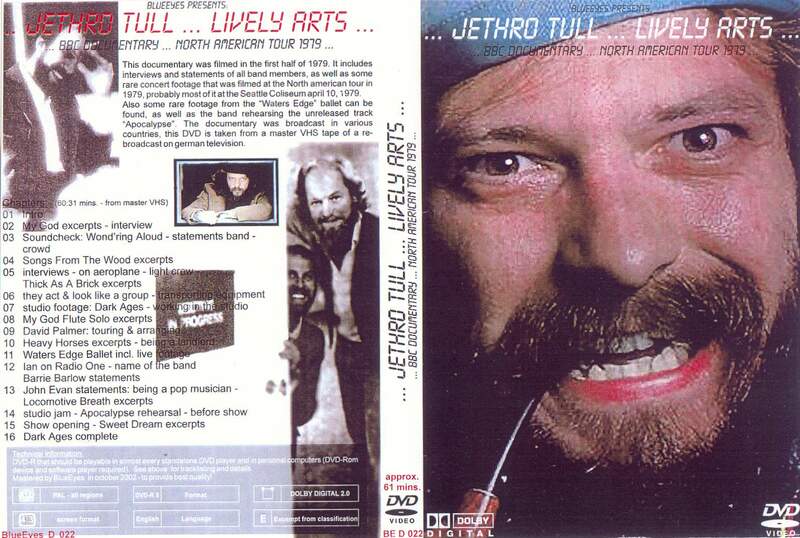 It's mainstream Jethro Tull acoustic repertoire, it would be known, I suppose, to the fans. Plus some fairly obscure little songs from the acoustic repertoire. In some cases two or three of them have never been played on stage. BM: Any hints on which those might be? IA: Well, funny enough, I was just looking at my setlist and going through it, and thinking, "There's three or four of these songs must be typo. I've missed some of the marks. I might be missing one or two out, but I have to think...one that's never been played on stage is a song called "Just Trying to Be." "March of the Mad Scientist." These are songs from the era just probably around the time of the Aqualung album that were songs that were played in the studio that were just - although they were finished and mixed - they were put to one side and sort of appeared, I think one of them came out on the Living in the Past album, which was in '72. 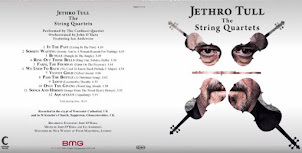 "March of the Mad Scientist" languished in a storage place in a recording studio until it appeared on the Twenty Years of Jethro Tull album in 1988 that would be. BM: And the "Solstice Bells" single, which I'm glad to say I own. IA: Oh, that's right. Well, that's actually a Christmas album. I'm going to do a Christmas tune in preparation for the Christmas period, but not that one. But things like "Back to the Family" which was kind of a rock song, sort of, kind of hippie song. I've been playing that one recently and I tell the audience, "This is the worst song I ever wrote. This is actually it. This is the worst piece I've ever done." [laughs] And they look embarrassed and stunned. And I tell them, "The reason we're doing it is I think we can make it sound a bit better now." And also it is really a pretty crap song, but it makes everything else sound so good. BM: What don't you like about that song? IA: A lot of things. It's one of those things, you have to revisit these things and meet your own demons once in a while. It's a song that I guess I find a little squirmy kind of. A little bit personal from the era of my leaving home and disappearing for the first time to seek my fortunes outside the context of the family home. It's one of those twisting, calling kind of, mixed loyalties and stuff. It's a song, I guess, looking back at it, I don't really like to think about that part of my life. I don't feel good about it. I think, on the other hand, you have to face up to these episodes that are actually quite pivotal in the way your life develops. That's why I sing it, confronting not demons, but just confronting a slight kind of embarrassed and befuddled period of late adolescence. BM: It's a pretty universal song if you're 21 or so. IA: There is that kind of an element to it. People will identify, but for me, personally, it's not a song I feel that great about. So I frequently tell people it's the worst song that I ever wrote. It's kind of half-true. So anyway, that's one of the ones that hasn't been played before, since it was the one and only time we played it in the recording studio. And then there's a few other things that have not made much of a...not appeared in a long time, like "Jeffrey Goes to Leicester Square," which I think we played in the UK, but I don't think we've ever done that one in the USA. And then there's a few classic sort of things, "Dun Ringall" from late-'70s period of Jethro Tull. "Jack in the Green" from the Songs from the Wood album. "Skating Away," my first climate change song. I wrote it in 1974 on the War Child album. "Rocks on the Road" which is a largely acoustic piece although it gets a bit louder towards the end. BM: "Skating Away" is about climate change? I prefer the term global heating, because we are actually talking about a substantial - an almost inevitable now - change. Just a few years ago, three or four years ago, people were talking about a degree or two in the next hundred years. Now scientists seem to be agreeing that we are actually looking at something like four degrees as a very likely scenario, which of course means that much of the planet will become extremely difficult to live in. Food production, water resources, along with all of the inevitable problems of the mass migration of large groups of people and problems with Mexicans moving a lot, or do you think that's California's problem? It's not only Mexicans, but a large portion of South America will be heading north and south in that context, so a lot of people around the Mediterranean will be facing horrendous mass political, social, economic migration from Africa. South Africa will have an enormous problem because it's of course it's the only relatively fertile chunk of Africa, which is already becoming overwhelmed with of course political refugees from Zimbabwe in particular. But when things get tough in Central Africa, it's going to be masses of people moving north and south. I mean, all these issues have been scary. They do have to do with running away from just a species including man who spread around the planet in times gone by, driven by the changing planet, driven by the need to hunter-gatherers to collect porridge for food and kill animals and that's not actually so different today when you look at the realities and the parallels of contemporary life. It's an issue, but lots of people weren't talking about it back in the mid-'70s, just as there are lots of people right now who are living in denial about climate change and the outgoing president kind of all but final year of presidency denying any evidence of climate change. Tony Snow, apart from the White House when he was a spin doctor for Bush, was also struck with that awful disease of just being, just living in this bubble that it wasn't happening. I could take Tony to task a lot about it and say, "You show me any information you can find that scientifically will debunk the data that is now very well established." There's all sorts of websites, you can go to all sorts of places and find out why climate change is just a fabrication, blah blah blah blah blah. Well, send me some links. Show me what you're reading. You know, if that's true, the world needs to know about it. But if it's not true, you and the president and a whole lot of other people have got a lot of rethinking to do. I used to say, Tony, you never came up with any reference for me to take him to task on. Sweet guy that he was, he was one of those who right up until the last few months of his life, he was in denial about climate change, and the sad reality of course when he had to bite the bullet and say, yep, okay, there is a man-made component to this. [laughs] Yeah, okay, we got there. But sadly for some people, including Tony, too late to be a participant in any further education on the subject. As a journalist I guess and ex-White House man, he probably could have done something constructive things. I will say, he would have been a great White House press secretary for Obama. Although he was a Republican to the soul, to the core, I think he was also a true professional, and as a well-respected political journalist, I think he would have done as good or better a job for Obama than he would have done for Bush. But sadly, of course, he would never have the chance. Well how are we doing then? We have climate change, songs, '74. Back then, we started to learn about these things and it seemed like a good idea for a little song. And of course you can look at it now and say, of course it's embarrassment because it was a song about actually the opposite occurring, but maybe not. Because even now, we know that there is a very great potential for the North Atlantic Conveyor, the so-called Gulf Stream, to slow down or even cease as a result of atmospheric warming and surface water warming and if that happens, then we would see a mini ice age that would cover all of North America and all of north western Europe down to the shores of the Mediterranean. So we would see something like the ice age cover that existed ten thousand years ago at a time when we had just a few million humans on the planet and many of them obviously survived. That might not be the case today. It might just be fifty or a hundred years you're saying, gosh that guy was a clever bugger - he wrote a song back in 1974 that describes a scenario of ice sheets coming towards us and having to flee. Anyway, there you go. 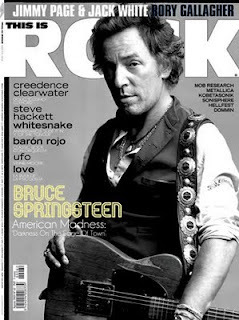 con 'Darkness On The Edge Of Town', Bruce Springsteen continuaba forjando su leyenda después del éxito de 'Born To Run' y tras un parón discográfico obligado por los desencuentros legales con su manager Mike Appel. Un Springsteen más serio, más reflexivo, con una colección de canciones que buscaban la inspiración en los films noir de los setenta. El legendario icono y guitarrista de Led Zeppelin, Jimmy Page, protagoniza con Edge de U2 y Jack White de White Stripes el documental "It Might Get Loud". Jack y Page están en su habitación en un hotel de Beverly Hills promocionando su documental, donde se les muestra reunidos para explorar sus diferentes estilos musicales. Cuando se habla de secciones rítmicas clásicas, siempre se piensa en John Bonham y John Paul Jones o Jack Bruce y Ginger Baker. 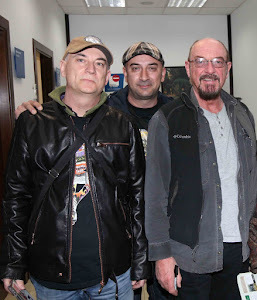 Sin embargo, Doug Clifford y Stu Cook, batería y bajo de la Creedence Clearwater Revival respectivamente, son los responsables de las pistas rítmicas más fuertes y potentes grabadas en una cinta. Clifford era un batería muy simple, pero tenía un sentimiento que complementaba perfectamente los temas de John Fogerty. La soledad del corredor de fondo es lo que se nos viene a la cabeza cuando pensamos en la carrera en solitario del que fuera guitarrista de la formación clásica de Genesis, la que firmó clásicos como 'Foxtrot' o 'The Lamb Lies Down On Broadway'. Ha pasado por todos los estilos musicales en una continua exploración de las posibilidades de su instrumento. El londinense no ha cesado de investigar en toda su carrera. Cuando se menciona la psicodelia, son muchos los nombres que vienen a la cabeza: The Byrds, Yardbirds, Beatles, The Beach Boys, Jefferson Airplane, Pink Floyd, etc. De Love pocos se acuerdan, a pesar de que fueron tan importantes como la mayoría de los citados, además de tener un trío de discos sencillamente genial, compuesto por 'Love', 'Da Capo' y 'Forever Changes'. Este año ha visto una oleada de actividad de Moore, en primer lugar el lanzamiento del nuevo álbum de estudio 'The Visitor', que a pesar de la ausencia del bajista fundador Pete Way, muestra al rock veterano regresando al estilo del sin duda su mejor lanzamiento más reciente, 'Walk On Water'. Templando su tempo, han basado su fuerza con una saludable dosis setentera de blues rock, la influencia del guitarrista queda acuñada en toda la grabación. Tanto a través de la composición como del trabajo estelar del guitarra que brilla de principio a final. acaban de publicar 'En Clave De Rock', un directo en el que se acompañan por la banda sinfónica de Mislata de Valencia. Un trabajo en el que los hermanos de Castro han querido romper ciertos moldes, pero dentro de una manera muy española. 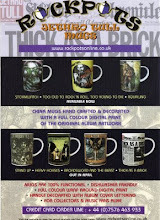 Backline Pearl Jam, Mirage, Bad Sneakers, Starcastle, Forgotten Suns, Zivil, IQ, Steve Miller Band, Ohmphrey, Guthrie Govan, Vinilo, Libro, Bootleg, Rockstore, Livewire, Agenda.